Another horrific development is underway in Councillor Kristyn Wong-Tam’s area of governance! Godzilla like machinery has been deployed at Jarvis and Dundas which is clawing away on century old architecture. 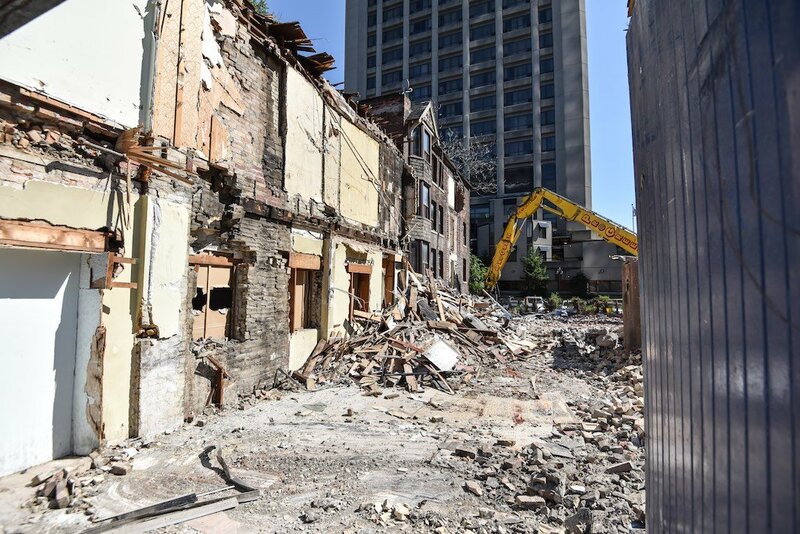 The “well thought out” demolition and redevelopment was contrived by Toronto City Councillor Kristyn Wong-Tam along with “City Planner” Jennifer Keesmaat who believes every street should be a grand boulevard. The last time I checked, a boulevard was a dead end! 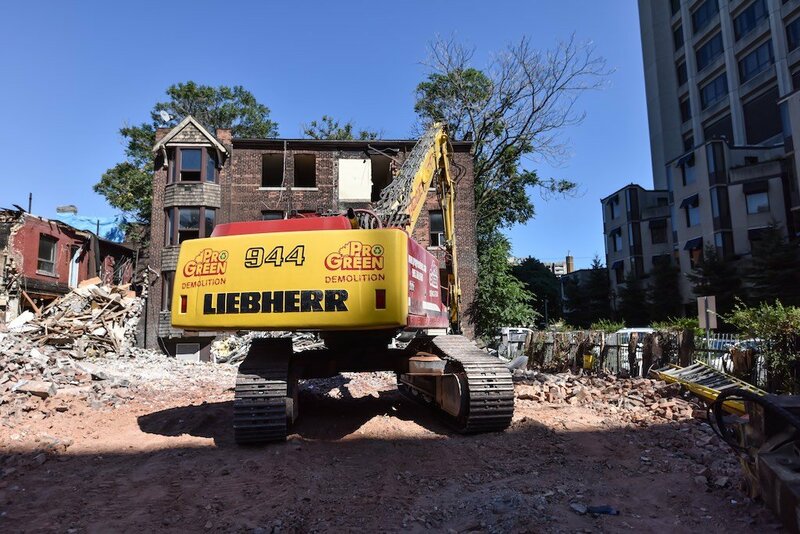 So city planners are shredding large amounts of the Garden District to put up – what else? 50-story condos which will only contribute to ill-conceived architectural blending and considerable draining of our city’s infrastructure. The Garden District was once known as one of the most influential neighborhoods in Toronto with city builders such as Massey, Gooderham and Jarvis himself. While it has become an area of low-income housing, prostitution and housing for the those that are destitute, it seems city officials are quietly throwing out residents which have depended on the community for decades. 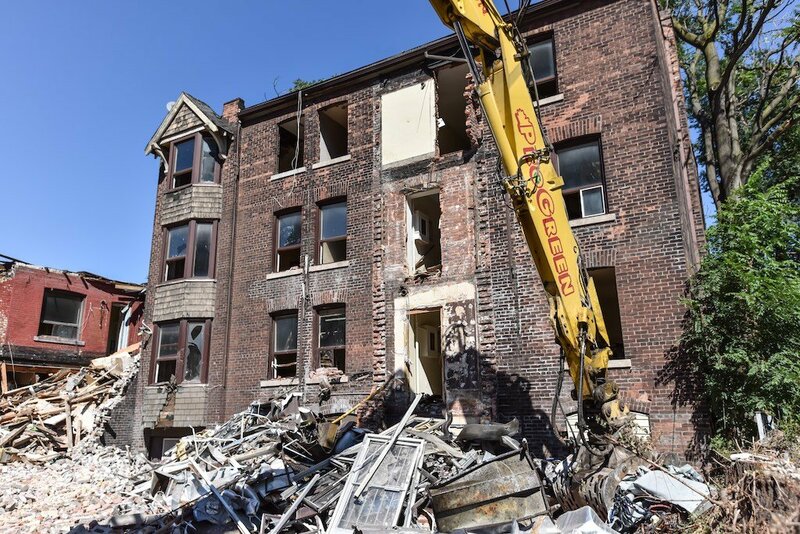 The demolition and reconstruction is quietly going on in Toronto with little or no coverage by local media. 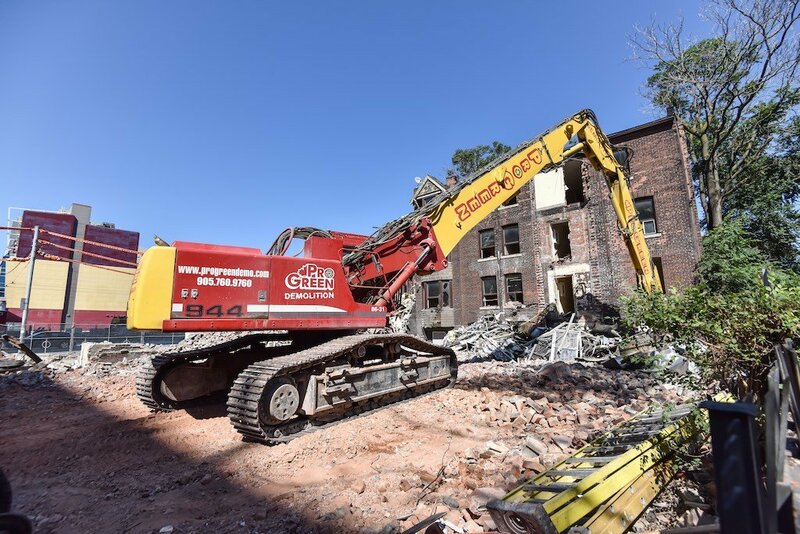 Historic buildings are being clawed away into rubble with plans of “Grand Boulevards” ending in Dead-End Streets. Disasters like Queen’s Quay West and the new Canary District are examples of poor thought out city planning – only to promote their supposed vision of “progressive” visions of grand boulevards leading to nowhere! Progress and supposed “forward thinking” is the suggested spin on what is going on in the Garden District. I would have thought more gardens would have been put in place – along with 3-story brick structures to complement the existing architecture. This is not happening and old ruins will result in much larger ruins in the years to come! This entry was posted in Architecture, Condo, construction, Garden District, Toronto and tagged Garden District, redevelopment, Toronto. misleading !! The photos appear to be from the very recent demolition of a **15 story hotel ** which was located right on the NE corner of Dundas / Jarvis. Some scaremongering to suggest that historic “century old” 3 story homes are currently being destroyed on quiet Garden District streets. You obviously must be from the suburbs. 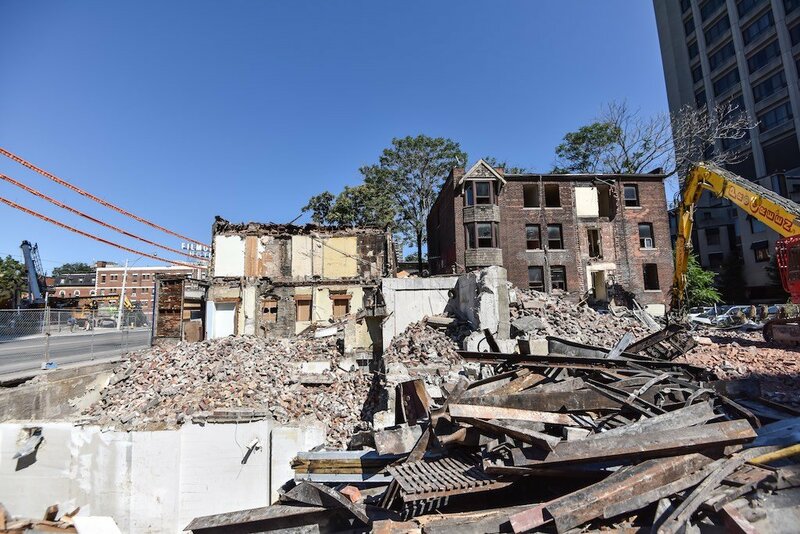 While the NE corner has been demolished, this is the SE corner, and yes, rows of century plus buildings are being destroyed. **Directly across** from this demolition, on SW corner of Dundas/Jarvis, is recently completed 42 story condo (Pace Condos). Not realistic to think that the city would have the power to force a private landowner to maintain 2-3 story buildings on this corner. Sure they can, Bill. It’s called zoning. They can limit height. The city does not have the infrastructure to support these towers. Look at what happened this weekend on Queen’s Quay West. Twelve condos lost electricity for 18 hours due to ancient hydro lines. Thanks for commenting on my blog, BTW. Hope you’re having a good weekend. I have to agree with the author of this article. City planners are making a complete mess of this once great city!